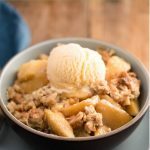 Gluten Free Apple Crisp - Quick and Easy! 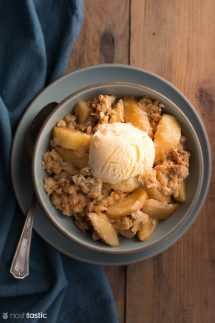 Gluten Free Apple Crisp is so versatile, you can eat it for a healthy breakfast option, or throw on some ice cream for a delicious dessert! I made my gluten free apple crisp with a similar topping to my Gluten Free Fruit Crisp, it’s packed full of oaty goodness, a little maple syrup, and some almonds for crunch. Start by assembling all your ingredients, then mix the lemon juice, cornstarch, brown sugar and water together before you peel the apples, put the mixture into a large bowl then preheat your oven to 375F. You’ll need a baking dish that is approximately one quart. 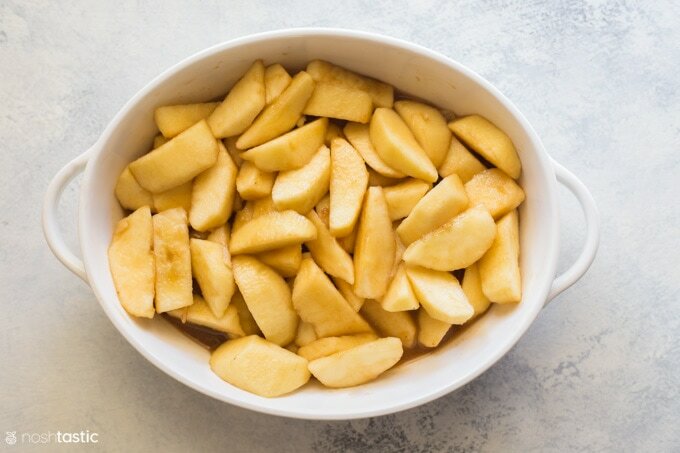 Peel the apples and put them in the bowl and toss in the lemon juice and water mixture, then layer them in the baking dish like you see in the photo below. Just a quick note to make sure you know to only use certified gluten free oats, not all oats are suitable for people on a gluten free diet. While the oat grain contains no gluten, they can be contaminated with gluten containing grains in the field when they are grown, or where they are processed. Top the apples with the oatmeal and almond flour mixture and spread it out nice and evenly over the top of the apples. Bake in your preheated oven for about 30 minutes or until the top is nice and golden brown. We love to serve it with Ice Cream, if you are dairy free there are some excellent dairy free ice creams that work well too! If there are leftovers then we eat it for breakfast. It has less sugar I’m sure than the average breakfast cereal so it’s a great option and is perfectly tasty cold, or you can microwave it for a few seconds to reheat but it won’t be quite as crispy. What’s the difference between Apple Crisp and Apple Crumble? Sometimes the difference is minimal, and often the names are used interchangeably these days. Generally speaking though, a fruit crisp has a topping that includes things like nuts, oats, sugar, and spices and is more like granola in texture, and well, crispy! 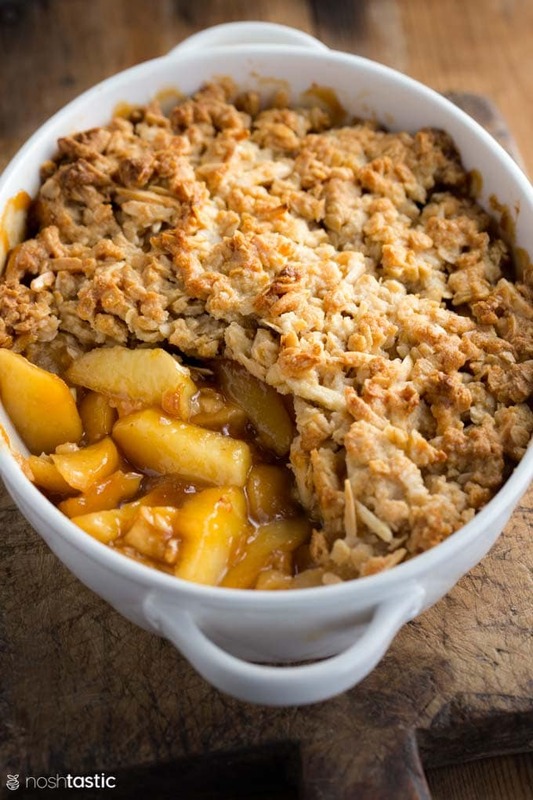 A fruit crumble is usually topped with more of a streusel topping which is softer and made with a mixture of butter, flour, and sugar. 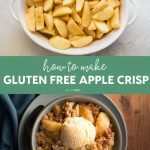 Easy Gluten Free Apple Crisp Recipe that works perfectly as a dessert or a healthy breakfast option! Mix the lemon juice, cornstarch, brown sugar and water together in a large bowl. Cut and peel the apples into large chunks and mix into the lemon water mixture in the bowl, and once they are evenly coated place them in your baking dish. 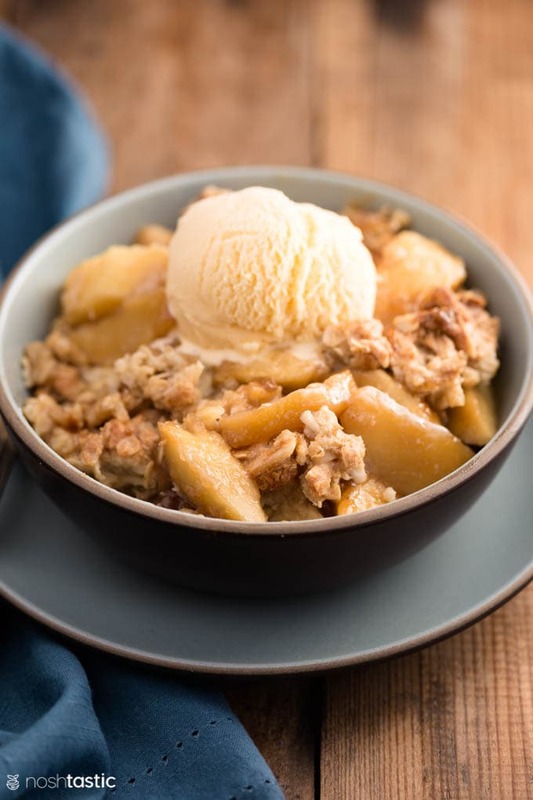 Mix the Gluten Free Apple Crisp Topping ingredients together in a bowl including the gluten free rolled oats, almond flour, slivered almonds, maple syrup, coconut oil (melted), vanilla extract and salt. Evenly spread the topping over the apples. You can serve it hot from the oven, or cold later on. Storage - you can keep this in an airtight container and eat it hot or cold. I just reheat it per serving on a plate in the microwave, the topping is not quite as crisp but it works in a pinch. 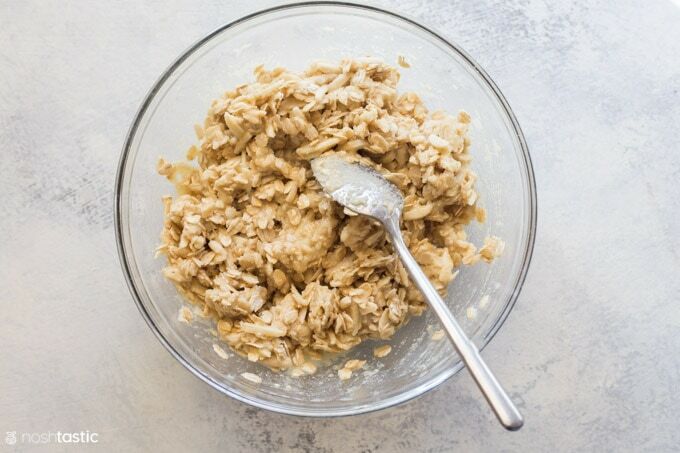 Gluten Free Oats - If you are making this for someone who eats gluten free then you must ensure that you use certified gluten free oats, regular oats can have gluten contamination.